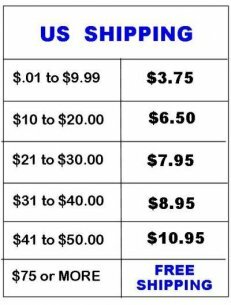 Our Shipping rates are calculated on the basis of the dollar amount of your total order for US Shipping. The rates are calculated by the following chart and such fees will be automatically added to your final credit card charge. International Shipping to Canada, Australia and United Kingdom are calculated on the basis of the dollar amount of your total order.